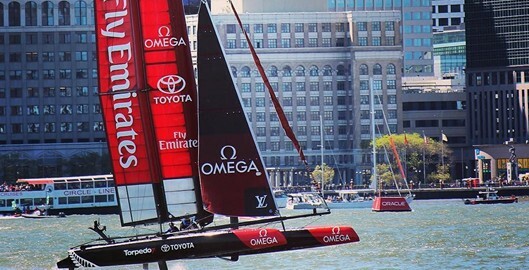 This week’s photo is from the America’s Cup World Series, which was in NYC on May 7-8th. I honestly didn’t know anything about this sport, but it’s quite impressive from both an athletic and technology perspective.The boats are designed with hydrofoils (or foils) on the bottom of the hulls that actually lift the weight of the boat out of the water. You can see them in the photo above — they’re the vertical things that are holding the boat out of the water. If you’re curious, watch this video about how hydrofoils work. Hydrofoils are relatively new for the America’s Cup and it’s forced the teams to learn how to sail with this new technology. This is a great example of how no matter what field you’re in, technology will likely force you to constantly keep updating your skills. In the field of user experience and design, this is especially true. To stay current, designers should stay curious and constantly question the context. One little problem though … it’s amazing to me that there are design courses available that claim to teach you how to be a user experience designer in a matter of weeks. Honestly, I’m not sure how this is possible. I find myself learning something new each week and I’ve been in this field for a while! How do you stay current? I think that the best designers are in a constant state of curiosity. A lot of courses focus on teaching software or know the steps in a process. But that’s not enough. Software will change. And the process you use is completely dependent on the context of your project. Another big challenge is that our medium is always changing. New browsers come out, new devices come out and user habits change. As a result, we have to always be shaping our approach and our solutions. What we did six months ago might not work anymore. Don’t let the ever-changing field of design overwhelm you. Don’t let the ever-changing field of design overwhelm you. But don’t let yourself get sucked into the temptation to just do what you see other companies and designers doing. Take time to understand and then be able to justify every design decision you make. If you can’t, then you know you didn’t think it through enough.